UPDATE: The book is out! See www.personalitynotincluded.com for details on the book. Faceless companies don’t work anymore. In a world where consumers have more access to information than ever, and more power to share their voice … a brand’s identity is no longer controlled through marketing and advertising. In this new era, what you say your brand stands for is no longer good enough. What you demonstrate to your customers matters most. This is the power of your personality. 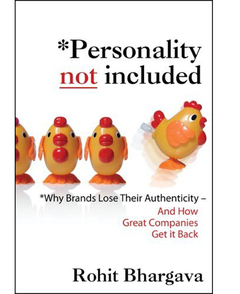 Personality Not Included is an essential guide for brands on putting back the missing ingredient in their marketing to build loyal customers, foster consumer (and employee) evangelists, and create a connection that goes beyond profit. The future of business requires new authenticity. Personality is the secret weapon that brings authentic brands to life. The Personality Project – In early 2008, I will launch a fantastic group contributed blog called The Personality Project which brings together the voices of 100 visionary minds from business, art, social media and many other industries, to all answer the simple question: what’s your personality? Some amazing contributors have already agreed to participate and the team assisting me and I will continue to gather contributions over the next few months. Look for the landing page to be up soon at www.thepersonalityproject.com. Influential Marketing Friends Group – I am a big fan of Facebook and have been considering setting up a group around my blog for some time now. To coincide with this post, I have finally done it and the group is called Influential Marketing Friends and is targeted to anyone who is in the field of marketing or sees themselves wanting to be in it. Not sure how much discussion this group will yet yield, but I’m still glad to be launching it. If you are on Facebook and find the idea interesting, feel free to join. Amazon Book Page – Nothing makes you feel like your project is more "official" than when you finally get a page on Amazon.com. The description of the book on this page is totally wrong (so please ignore it until I can get it changed), but I am learning there are lots of tools on Amazon that help authors to promote their book which many authors don’t use. I am already working on setting up an RSS feed of my blog as a companion to the book through the AmazonConnect program, tagging and listing the book in the right categories, and filling out descriptions wherever possible. Considering the Amazon database is pulled from for lots of other sites, I am going to experiment with doing as much as I can with this page. Social Network Connections – Borrowing a format from my colleague from Ogilvy UK, Giles Rys Jones – I have updated my list of social networks that I use in my sidebar and will be finding unique ways to engage people through each one as the time for the book launch comes closer. For the time being, the main ones I am focused on are Facebook, LinkedIn, Twitter, and Flickr – but I’ll share more on some of the more wide reaching plans when the time comes. Already, several brilliant folks have been kind enough to offer advice for me on the book or talk about their insights on the role personality should play in marketing (some in the form of contributions for The Personality Project). I can’t share all of their names quite yet, but there are more than ten bestselling authors, a few internationally recognized filmmakers, more than twenty top notch bloggers and several unexpected "wildcards." I’ll be soliciting more stories about brands marketing with personality and looking for additional contributors to The Personality Project throughout the next few months. In the meantime, I’m looking forward to any feedback on the cover, title, thoughts on the premise of the book, or any other ideas you might have.